The parish of Bradworthy is situated in rural West Devon and is bounded to the north and west by two of the major rivers in the South West region. The landscape reflects the ravages of the often fierce south-westerly winds that blow in from the North Atlantic. 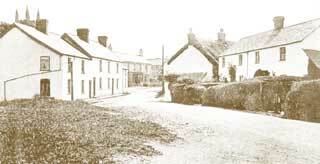 The view from the Broad Hill towards the Post Office in the 1910's. The village itself, standing above the little River Waldon, boasts what is reputed to be the largest square in the west country, a green, a Church dating back to Norman times, a school, a Memorial Hall and a War Memorial, an Inn, a bowling green and playing field, a modern industrial estate, a number of long established village stores, as well as a range of services such as Post Office, garage, doctor, and vets.